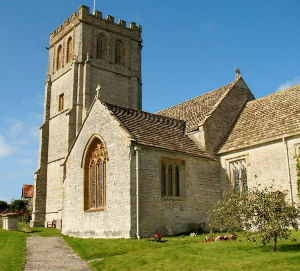 Historically, the Church was first mentioned in 1242 The building is of blue lias stone with hamstone dressings and the earliest part of the church is believed to be the nave which is of 12th century origin. The 70 ft church tower was added at the west end in the 15th century but had originally been built above the north chapel. The pulpit dates from 1627 and the font bowl is of 12th century origin. Sunday Services are held each Sunday. The first Sunday 11.00 am Family Worship, Second Sunday 9.30 am Holy Communion, Third Sunday 6.00 pm Evensong and the Fourth Sunday 9.30am Holy Communion. we regularly have a "Benefice Together Holy Communion" around the churches in the Benefice.